Summer is here! And if you’re traveling to a PetCure Oncology location, these are a few dog beaches your pet will love. There’s no better way for your pet to celebrate their new role as a Pet Hero than running along the waves and getting some fresh air. From the West Coast to the East Coast, here are some doggy destinations you won’t want to pass up. From September 16 until May 15, dogs are allowed on the boardwalk and along the 8thAve beach all day. 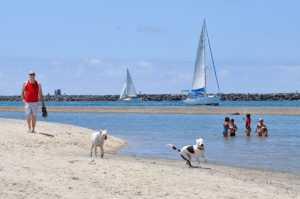 During the warmer, summer months dogs are allowed on the 8thAve Dog Beach between the hours of 6 p.m. and 8:30 a.m.
From Memorial Day weekend until Labor Day Weekend you can take your pup to Fisherman’s Cove beach before 10 a.m. or after 4 p.m. You’re also able to use the upland trails at any time as long as your pet is leashed. From May 1 to Labor Day, you can take your pet pal to Myrtle Beach before 10 a.m. and after 5 p.m. as long as they are on a leash. On Pawleys Island beach, dogs must be leashed only May-October. Take your pooch for an early morning stroll off the leash between 5 a.m. and 10 a.m. at Sullivan’s Island. Thereafter, dogs are permitted on the beach while leashed after 6 p.m. Dogs are allowed on the sandy Jacksonville and Neptune Beaches before 9 a.m. or after 5 p.m. if they are leashed and their vaccinations are up to date. 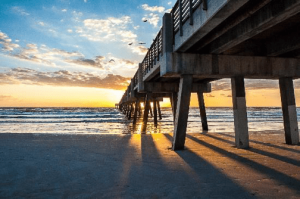 You can bring you pup to Atlantic Beach along the Florida coast at any time if they are on a leash no longer than 12 ft.
At Harrington Beach state Park, dogs are always permitted if they are leashed and picked up after. There are no additional pet fees and the park is open year-round from 6 a.m. to 11 p.m.
Pets are allowed on the Black River hiking trail, the black river marsh boardwalk and marsh trail, the fishing pond trail and the beach area north of the nature center. Your pet is welcome in all these areas as long as they are on a leash no longer than 8 feet. Although not a natural beach, there are plenty of water features and hydrants at the Lions Dog Park at the London Bridge Beach. Dogs can roam free without their leash at any time. 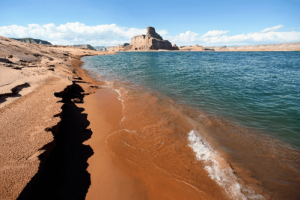 Lake Powell is 186 miles long and pet friendly if pets are leashed. It is a sight to see and is a reservoir created by the Glen Canyon dam. Additionally, dogs are welcome along the three-mile hiking trail that is Pedestal Alley. For just $7 per dog, you can visit the Misty Pine Dog Park. There you can enjoy the fenced in playground, swimming pond, and wooded trails. Be sure to contact the facility in advance to ensure your dog has up to date vaccinations. Lloyd Park is a mostly fenced in park where your pet can have some friendly canine fun. Let your pet roam off the leash so that they can explore the creek that is open to any dogs of all sizes. Let your pup roam around freely at this off-leash Dog Park in San Diego. Your pet can roam in the sandy dunes and wade by the water or fully immerse themselves. 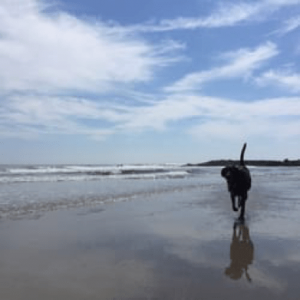 As one of the first official off-leash beaches in the U.S., you know you are in for a good time with your pup. The Original Dog Beach is the perfect place for humans and canines to enjoy the outdoors together at all hours of the day. Are there any great dog beaches we have missed on this list? Let us know!